Modern communication has evolved far beyond the written word, and the software we use to help us keep in touch has been racing to keep up. Last month we checked out the latest SwiftKey beta release, updating the keyboard software with not only a new toolbar-based interface that makes spicing up text with your favorite emoji and GIFs easier than before, but also introduces a new customizable Stickers system. After that beta whet our appetite, the new features are finally ready to go wide, with today's release of SwiftKey 7.0. 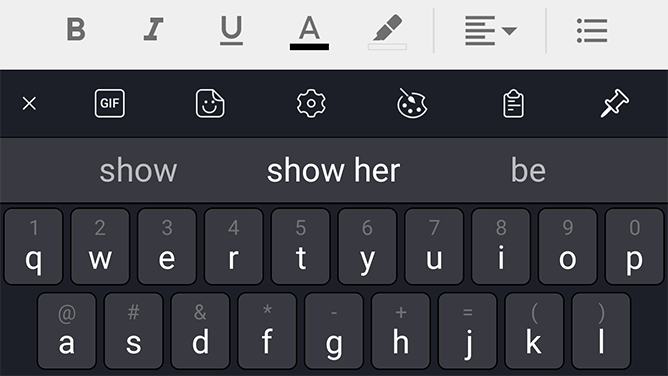 As we mentioned, the big news with this update is the SwiftKey Toolbar, which begins life as an inconspicuous little + sign tucked away to the side of word suggestions. Give that + a tap and the Toolbar pops up into full display, giving users quick access to their clipboard, settings, themes, and no shortage of illustrations with which to spice up their messages. In addition to the regular slate of emoji and searchable GIFs, we also see the arrival of Stickers, a flexible way to add imagery and text to conversations. You can get started by downloading a pack of Stickers, with currently available options including unicorns, memes, and a whole, whole lot of cats. Some Stickers you can augment with custom text overlays, and favorites can be saved to the Collections section of the Toolbar, for quick access later. If none of the available Stickers packs are to your liking, you're not out of luck, as you can also create custom Stickers right from the Collections tab; just select any image on your phone to start, and add the custom text of your choice, and save for later. Now, we have to concede that not every smartphone user is going to be jumping for joy at the idea of peppering up messages with a bunch of colorful Stickers, but SwiftKey also teases a few more utilitarian features landing in the near future. Soon you'll have the ability to share calendar appointments, and users in the U.S. and India will be able to be able to share their phone's location data. We also see all the “Lish” language support from the most recent beta make its way into the stable release. Check out the new SwiftKey 7.0 on the Play Store or APK Mirror and give the Toolbar interface a spin. Do you love the new look, or prefer the old Hub design? Let us know in the comments.